Tongue & Cheek's fried chicken and waffles. Thanks to Will Smith’s 1998 hit, we’ll never forgot that Miami is the place where the heat is on, all night on the beach ‘til the break of dawn. But according to our fans on Twitter, it’s also a great place for brunch. The hands-down favorite spot: South Beach’s Tongue & Cheek. Here’s what to order. 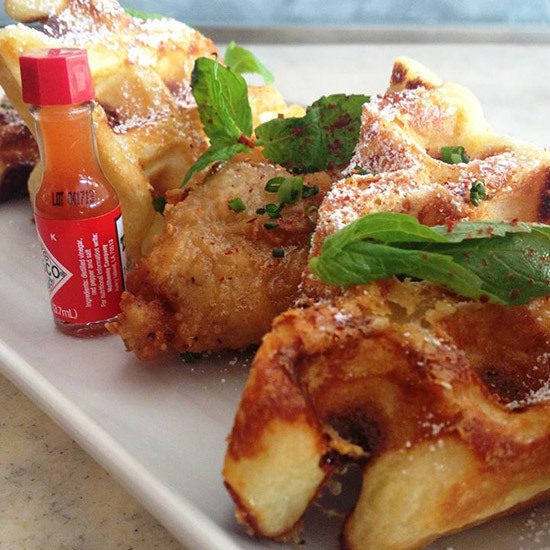 The Dish: Fried chicken and waffles. To make it, chef-owner Jamie DeRosa first sous vides the chicken for extra-juicy meat. Then he coats the pieces in corn flakes, flour and seasoning, fries them and tops it all with honey, the powdered chili pepper piment d'espelette and powdered sugar. He serves the dish with a savory cheddar-green-onion waffle and sherry-aged maple syrup. "Maple syrup is like gold. It's amazing," DeRosa says. "I'd put maple syrup in my hair." The Drinks: Mimosas with local orange juice, bellinis with housemade peach puree and True Bloods (Tongue & Cheek's spicy bloody mary garnished with house-pickled vegetables). There's a $25 bottomless drink option for those who want to pregame for Saturday night or erase Sunday morning. The Scene: Democratic. Beach-going tourists down mimosas and share sticky buns alongside families eating lemon ricotta pancakes. The Bonus: Every weekend from 10 a.m. to noon, DeRosa serves free coffee outside of the restaurant. "We're trying to mimic a news café circa 1990s on Miami Beach," says DeRosa. "The locals have certainly taken to it. You’ll see people running and they’ll grab a coffee and then on their way back they’ll grab another." On Saturdays from noon to 3pm, there's live music from local jazz singer Cat Shell.